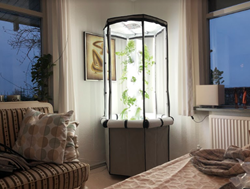 The Aerospring Indoor is one of the most versatile grow systems on the market, allowing the gardener to grow larger crops outdoors in warmer growing seasons and convert it to grow leafy greens, herbs, and salads indoors in the winter or even grow inside your home all year round. Since launching in 2016, Aerospring Gardens has sold more than 1,500 outdoor gardening systems. Today, Aerospring Gardens launched the Aerospring Indoor on Kickstarter with a funding goal of $35,000 to bring the state-of-the-art gardening system to production. In developing the Aerospring Indoor, the company chose to improve upon the design and functionality of its original gardening system and take it indoors, allowing consumers to garden year-round. First-time gardeners and seasoned urban farmers can now rejoice thanks to the Aerospring Indoor Garden kit. The compact gardening system comes with everything consumers need to start their own, personal urban farm, right in their own home. Easy to maintain and simple to harvest from, Aerospring Indoor is incredibly productive, generating up to 15lbs (7kg) of fresh, nutritious salads and herbs per month. The system uses aeroponics to grow plants without any soil at all. Plants grown with this method develop more than twice as fast and use over 90% less water than when growing with soil. It also eliminates the threat of pests and offers a more controlled growing environment, being completely weather independent. Seedlings are started in a hydroponic grow medium called rockwool, which is derived from basalt rock. It’s a clean and inert grow medium, which retains plenty of moisture and provides the roots enough oxygen to develop into healthy and strong plants. The Aerospring Garden incorporates a sleek, vertical, hexagonal pole design that fits in any small apartment, home or balcony. Once placed in the pole, the roots of the seedlings are then periodically showered with nutrient-rich water from the system’s bucket, which helps plants grow easily and quickly. The complete indoor gardening system, designed with patented, professional grade LED grow lights and airflow management in its own honeycomb shaped grow tent, allows consumers to grow up to 27 plants at a time using only 10 square feet of space, or one square meter. Zipping the tent closed boosts plant growth by 30-40% and allows the user to grow any kind of crop in the privacy of their own home. Additionally, the system is on wheels, allowing consumers to move it around the house, and the lighting and irrigation schedule can be controlled from a smartphone. Starting at just $839, the starter kit includes patented professional LED grow lights, a fan, a wheelbase and lightweight frame, a tent with six zippable panels and wifi timers that allow plants to grow successfully indoors. Consumers can pre-order the Aerospring and the Aerospring Indoor Garden kit at pr.go2.fund/aerospring. The team behind the Aerospring had a goal to come up with a food safe system and design that was both functional and aesthetically pleasing. Aerospring Gardens’ goal is to provide the best growing experience possible, to allow people to take back control over their food, to reconnect with it and truly experience the joy of growing their own food, right at home. To learn more, visit https://aerospringgardens.com.